Getting rid of your stuff — too many spoons! We’ve all seen the organizing shows on TV – especially the dramatic hoarding cases – where the emphasis seems to be on removing items from the house. Reducing clutter is one step of the organizing process and it is never done without the client’s permission. No professional organizer should ever unduly pressure a client to give away something they want to keep. However, most disorganization is caused by too much stuff – stuff we forgot we have, stuff that doesn’t work, stuff we never use, and stuff that duplicates other stuff. Before we can start – whether we’re organizing a kitchen, a closet or an office – we need to know what is already in the space and what really belongs there. Let’s say I’m organizing a kitchen with a client. We start by pulling everything out of the cabinets. Almost immediately, the client will say, “I had no idea I still had that fondue pot. I don’t even remember the last time I used it.” I ask, “Do you think you will use it in the future?” She says, “No, it is too much trouble to set up and even more trouble to clean. I can give it away.” Bingo. The first item is released painlessly. Then we tackle the utensils. We empty drawers and the holders next to the stove. 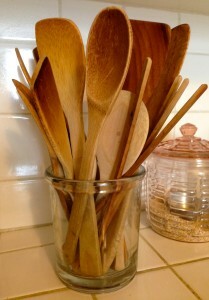 We discover that the client has over 15 wooden spoons and stirrers. She is shocked. “I had no idea I had so many wooden spoons,” she says. “No wonder I couldn’t jam anything more into that holder.” She easily rids herself of the old, broken or duplicate tools and keep only those that she uses regularly. Before we’re halfway done, there’s a big pile to donate, and an equally large pile to throw out. By the time we tackle the things with emotional attachments we’ve built momentum and decisions are easier to make. Once the detritus is gone, organizing what’s left is a much simpler process. The path has been cleared of clutter and it is easier to envision and create an organized space. You’re no longer clawing through useless items to find the one thing you really need. You know that everything you have is useful, beautiful or loved and has meaning in your life. You’re home free. Previous post: Help! I Can’t Remember My Password! Next post: Write Your Holiday Letter NOW!